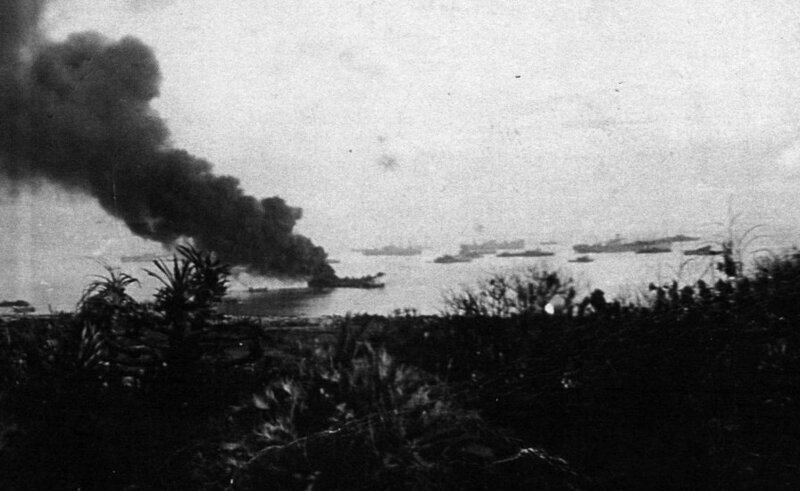 LST 808 burns at Ie Shima May 18, 1945 after being hit by a torpedo. She was later beached and was destroyed by a Kamikaze on May 20, 1945. She had collided with APA 62 USS Berrien on May 11, damaging the APA. LST-808 was laid down on 1 August 1944 at Evansville, Ind., by the Missouri Valley Bridge & Iron Co.; launched on 15 September 1944; sponsored by Mrs. W. I. Oliver; and commissioned on 29 September 1944. During World War II, LST-808 was assigned to the Asiatic-Pacific theater and participated in the assault and occupation of Iwo Jima in Feburary 1945 and the assault and occupation of Okinawa Gunto from April through June 1945. LST-808 was torpedoed by a Japanese kamikaze off le Shima on 18 May 1945. Grounded on a reef following the torpedoing, she was destroyed on 11 November 1945 and struck from the Navy list. LST-808 earned two battle stars for World War II service. On the evening of May 19, 1945, the tank landing ship LST 808 was anchored at Ie Shima, the island on which a sniper had killed famed war correspondent Ernie Pyle. It was midway through Operation Iceberg, the battle of Okinawa, and the ship was supposedly hidden in a man-made fog of oil smoke. However, the joke was that the letters LST stood for Large Slow Target. The 327-foot ship had previously served at the foot of Mount Suribachi, on Iwo Jima. She carried seven officers and a crew of 204. The communications officer was Ensign Robert K. Steunenburg, who would later become a Naperville resident and one of Argonne National Laboratory's finest scientists. At 2207 hours, the LST 808's engine room was hit by a torpedo from a low flying plane. The enormous concussion opened a five-foot hole in the hull, instantly killing the five men in the engine room and filling the air with the smell of sulfur. From the gray-painted communications room the following cable was sent: CROWBAR 808 THIS ANCHORAGE HAS RECEIVED HIT X ENGINE ROOM DAMAGED Then another: WE HAVE 6 FEET OF WATER IN TANK DECK An order to assist went out and was answered. BRAINWAVE WE ARE STANDING BY TO ASSIST CROWBAR 808. Most of the crew was off the ship by 0300, and the salvage officers began the task of removing everything valuable or secret. A security detail of five was on the ship when, at 1837 hours on May 20, a kamikaze from the 50th Shinbu Squadron at Chiran Air Base flew his Hayabusa fighter plane into the forward superstructure and crashed all the way down to the tank deck. None of the men on board the ship were badly hurt. Just another day in paradise. The final toll was 17 dead and 11 wounded.